Emotional inspiration and passion runs through the veins of Shaun Williams’ Peaky Blinders. 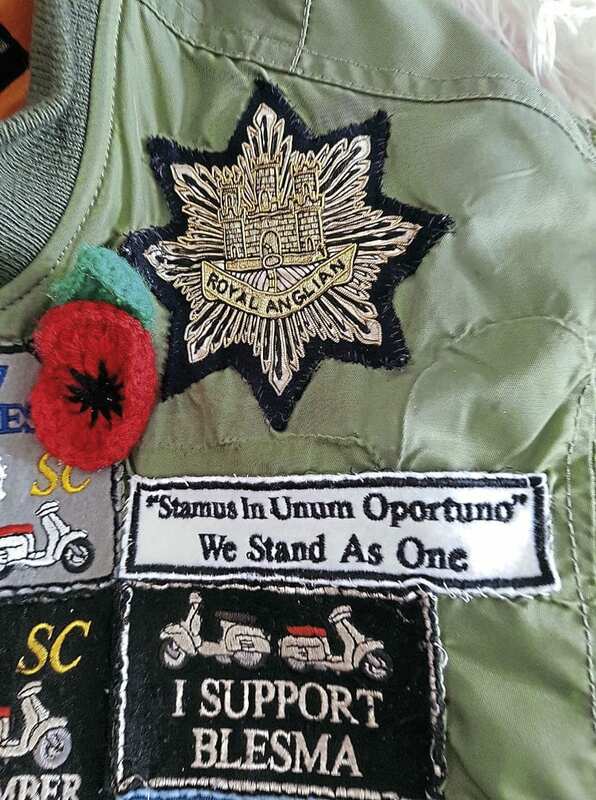 Now an ex-soldier, he joined the Royal Anglian Regiment in 1983 and has been into scooters since his school days. Shaun went to his first scooter rally, Skegness on a Vespa borrowed from a friend in 1984. Thirty years later he and his son, Shaun junior, went on the Skegness Rally together. 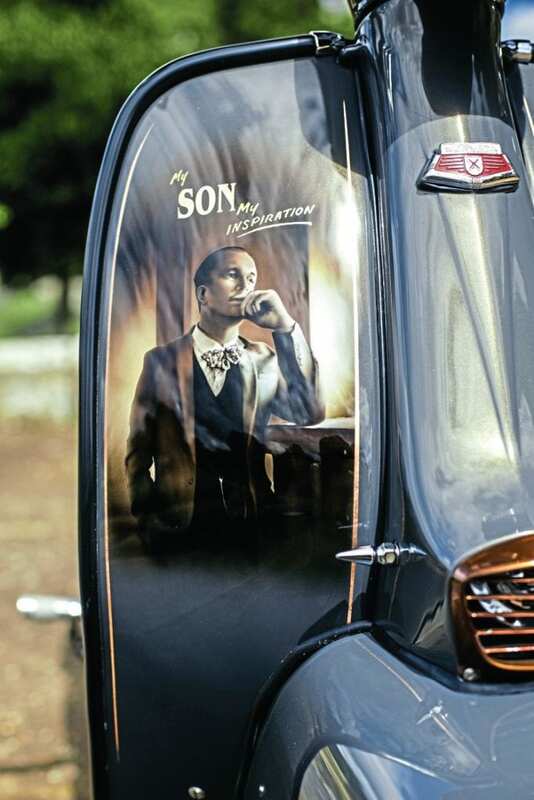 Shaun junior’s style of fashion has a Peaky Blinders element of influence and during that Skegness trip Shaun captured an image of his son, which helped inspire him for the theme for his scooter. Ty Lawer of Pageant Paintwork has 31 years of specialist experience and in late 2015 Shaun contacted Ty to discuss commissioning him for the job. Ty’s philosophy is to the point – keep it clean, no slappy stuff, it’s not a graffiti wall. 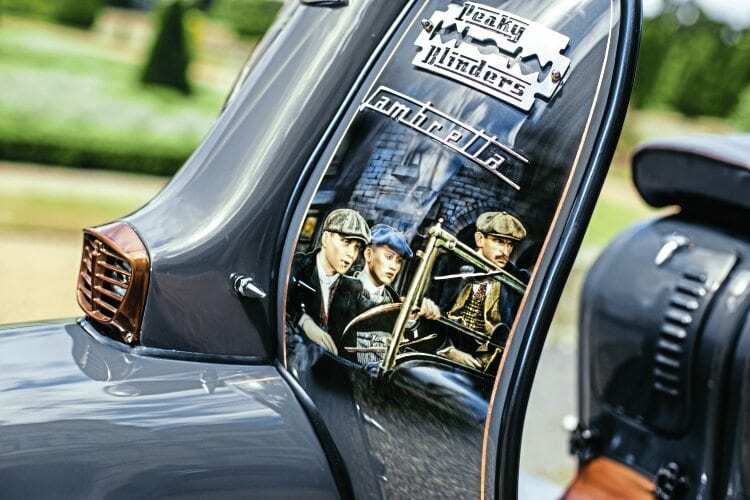 The base coat they chose is a sharp stylish grey, which represents the sharp suits worn by the Peaky Blinders as they appear in the TV series. Within the base coat is a fine copper flake, which draws your eye and emphasises the murals. 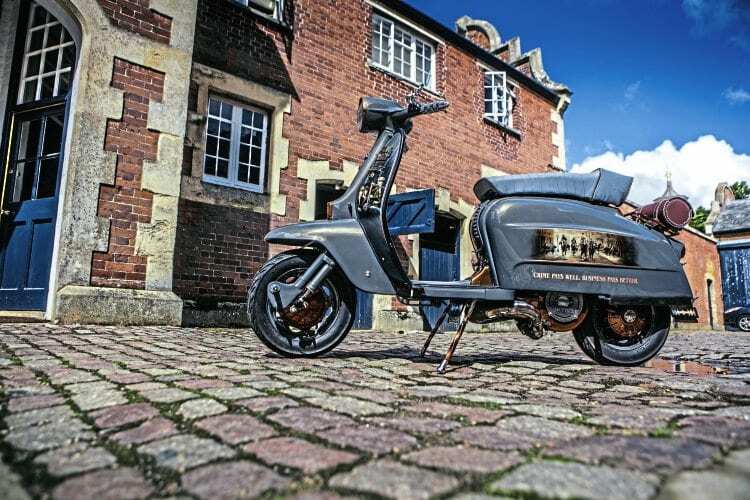 The parts of the scooter which are painted copper also represent the copper and industrial elements of Birmingham at the time, which supports the whole theme. Shaun considered several options for the front of the leg shields. The legshields required square images, which helped make Shaun’s decision easy. Pride of place would go to a mural of the image of Shaun junior, which would be accompanied by the phrase ‘My son, my inspiration’. 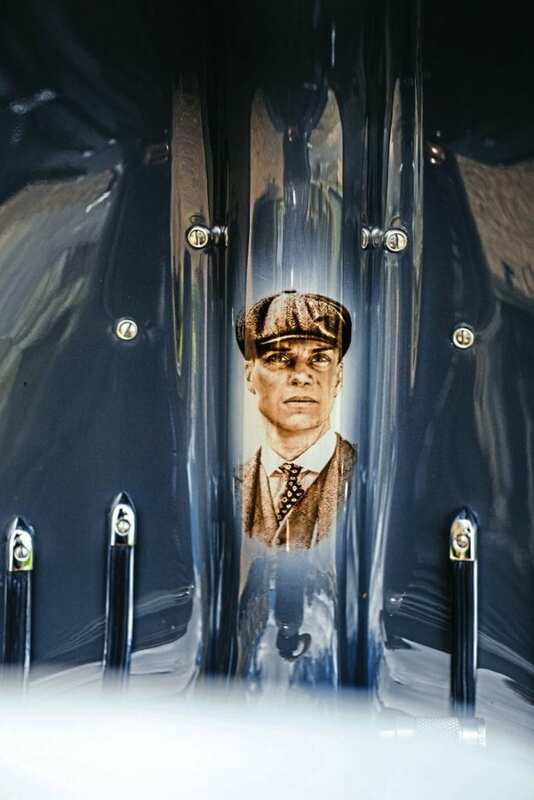 At the other side of the legshields, beneath a Peaky Blinders razor blade is a mural of the three Shelby brothers, Arthur, Thomas and Finn, and on the inside of the legshields is a mural of Thomas Shelby. 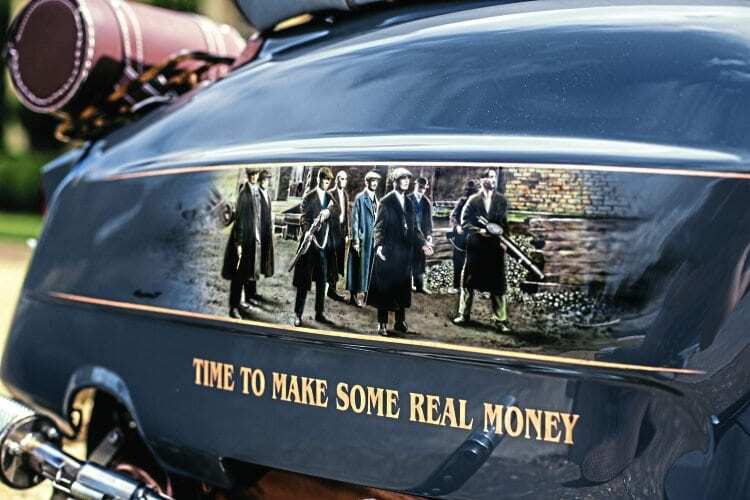 The phrase, ‘Time to make some real money’ sits on the right side panel, supported by a mural showing the Peaky Blinders toting a Lewis light machine gun, Enfield rifle and officers’ revolver. ‘Crime pays well. 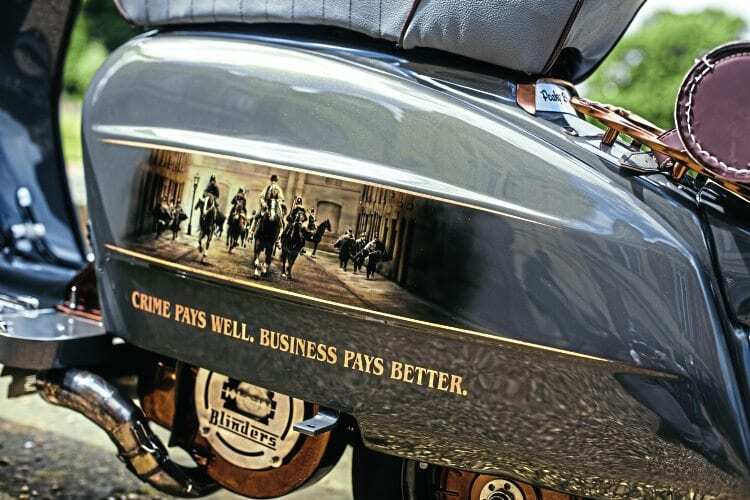 Business pays better’ appears on the left side panel supported by a mural of Chief Inspector Campbell on horseback leading other police officers. 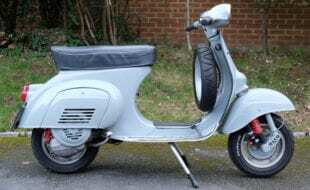 Shaun called in the services of Corky of Lambretta Vespa Covers to make a set of legshield paint protectors. Corky comes to the table with 39 years of experience and has an equally professional approach as Ty. In fact it’s not the first time the two have worked on a project together. Corky said: “In my opinion Ty is one of the best in world. His work is outstanding.” To get the covers spot on, Shaun briefed Corky on what he wanted; in turn Corky sent Shaun samples and Shaun chose the colours. Corky will say that the grey and tan was a challenge but Corky’s approach is similar to Ty’s; he gets a feel for the job and gets the job done. 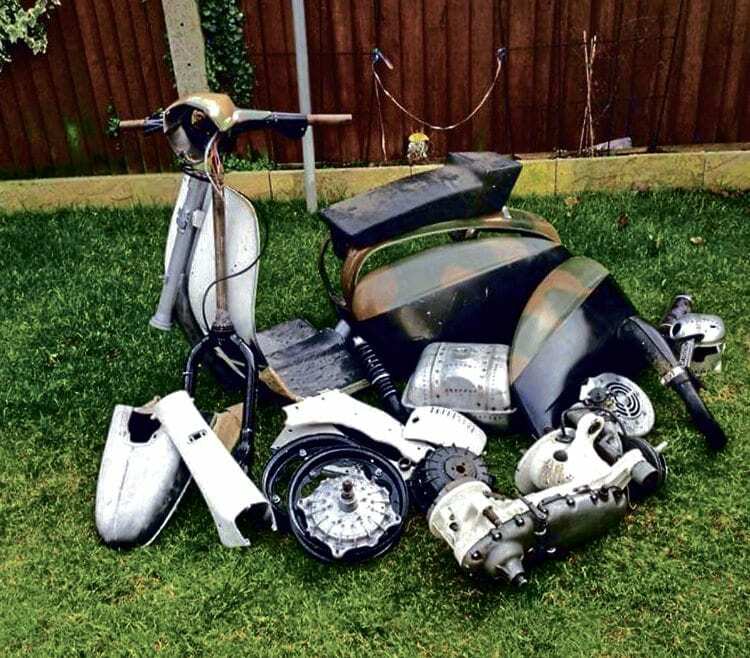 In March, with the engine fixed and the legshield paintwork protectors fitted, Shaun took the scooter out for the first time and disaster struck! He’d only been riding it for about half a mile or so when after hitting a bump one of the side panels sprung off and skidded past him! “I was in tears,” Shaun said. As it turned out, when the scooter hit a bump the depression of the suspension caused the pike nut on the rear hub to force against the inside of the side panel, popping it off. Shaun called Ty and explained what had happened. Shaun wanted the scooter to be on the road again ready for the Bangers n’ Mash do in April. Ty explained that he’d try his best but couldn’t make any promises. However; the deadline was achieved and with the pike nut replaced Shaun made it to the Bangers n’ Mash do where he won Best Paint. After losing the side panel, Shaun contacted Corky and requested a set of side panel covers. Corky suggested adding more quotes from the series to these and got these finished in time for Shaun to make it to the Leicester Phoenix Nights do where he won Best in Show. 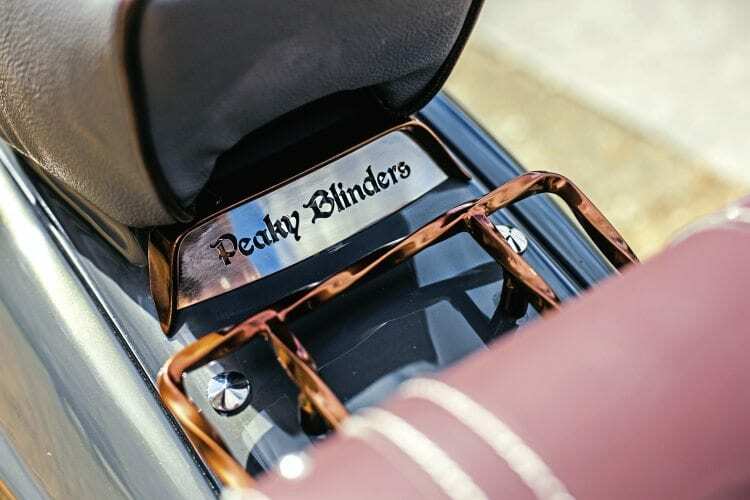 Keith Newman of K2 Custom Classics made the laser cut Peaky Blinders razor blade splash plate, mud flap, legshield name plate and flywheel cover. 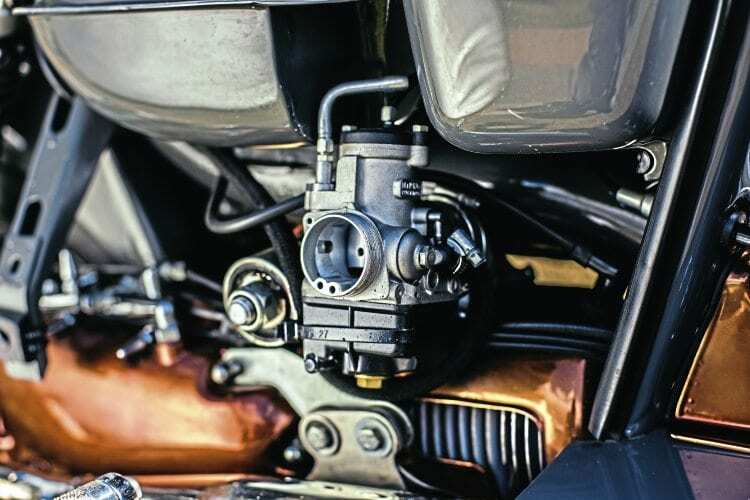 There are knuckle duster petrol and choke taps, the twisted stand and rear carrier are nice touches, which complement the copper painted features, and the billet kickstarter supports the overall effect. The handlebar grips are modified custom grips with bullet shaped ends. Shaun said, “I’d been looking high and low for some suitable grips and when I saw these I thought, Bingo! Got ’em!” The handle bar mirror and drilled front brake and clutch lever add further detail. 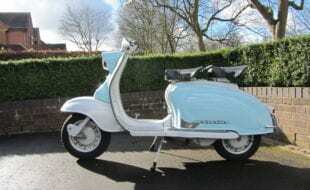 When I first saw this scooter I was blown away by the paintwork, everything about it syncs and sits right. There’s no shouting; all the work’s been done and it’s been done to perfection. By order of the Peaky Blinders. Scooter club & town: Armed Forces SC and L.O.S.T. = Let. Our. Souls. 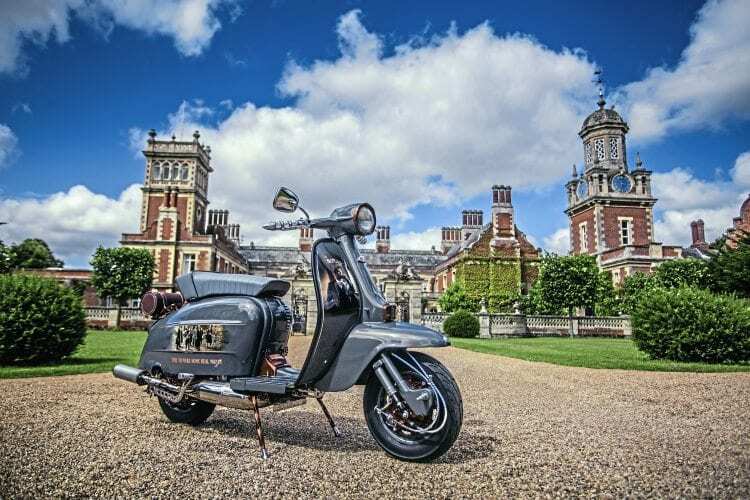 Travel, but ride with any club from the Great Yarmouth area. First interested in scooters: About 1981/82 last year at school; always used to go along to the Yarmouth Seafront to see the scooters. First scooter: Never could afford a scooter so I used to borrow a mate’s Vespa or go pillion with the Black Panthers Club at the time. Favourite scooter model: A good old Lambretta. It’s more my style and age. Lol! 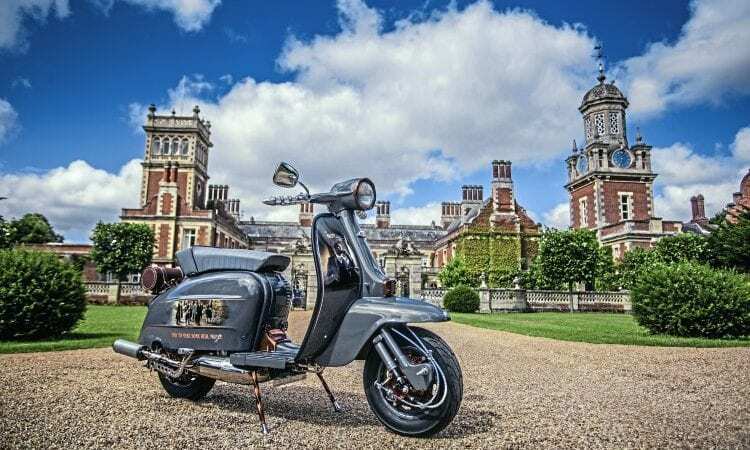 Favourite style of custom: Love a scooter with a good artwork or theme, nothing over the top. First rally or event: Apart from Yarmouth my first run on a scooter was October 1984, Skegness. How did you get there: Rode there. Any stories: Skegness ’84. It was cold and wet, not a lot of money as we had spent it on beer. We were hungry and I could see some kind of smoke/steam so I said, “Let’s go and get some chips.” As we walked closer it transpired that someone had set a caravan on fire! No food for us so we walked to the all-nighter and went in just to get warm and dry out. Favourite rally/event: The Cleethorpes National Rally is one that I enjoy, but I’m not really a national rally goer. I try to do at least one a year as I prefer the smaller rallies. Funniest experience with a scooter: On a foggy night I was riding pillion and we were heading home after a night out. My mate thought we were on a certain road so he opened it up. The next thing we were in someone’s drive! Luckily the gates were open and we managed to stop sharp, just denting the front mud guard! What do you dislike about rallies/events: Lack of clean toilets and having a snorer in the tent next door to you! 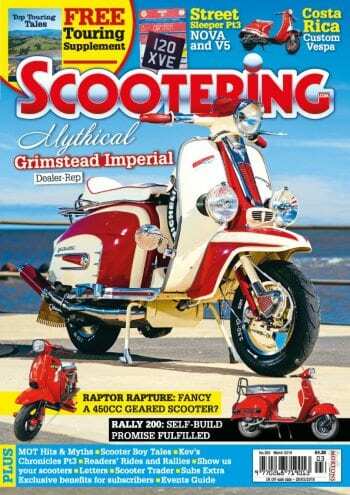 Favourite Scootering magazine feature: Custom features and the past rally write ups. If you had to recommend one scooter part or item of riding kit what would it be: A good set of waterproofs so you don’t get a soggy crotch! Lol. Most useless part you’ve ever bought: Lots. I have a shed full of bits not used on the project for one reason or another! 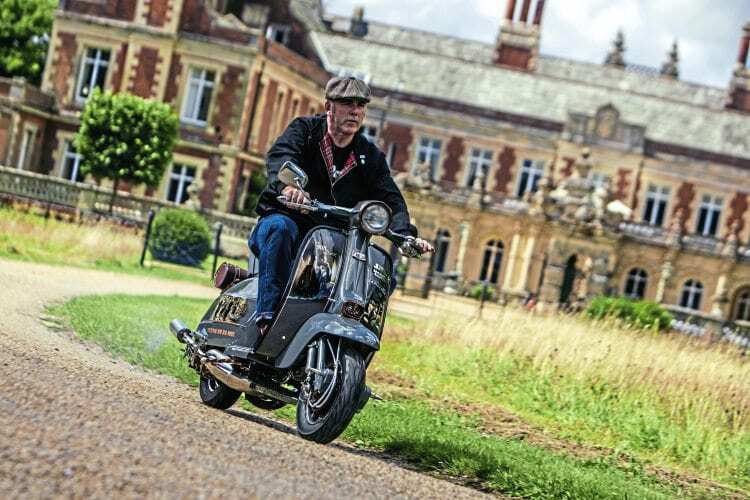 Name of scooter & reason: Peaky Blinders from the TV series. 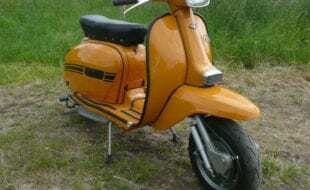 Scooter model: 1972 Jet 200. Date purchased & cost: Paid £900 for it in 2013 with no registration paperwork so it sat for two years until I knew what I wanted to do with it. 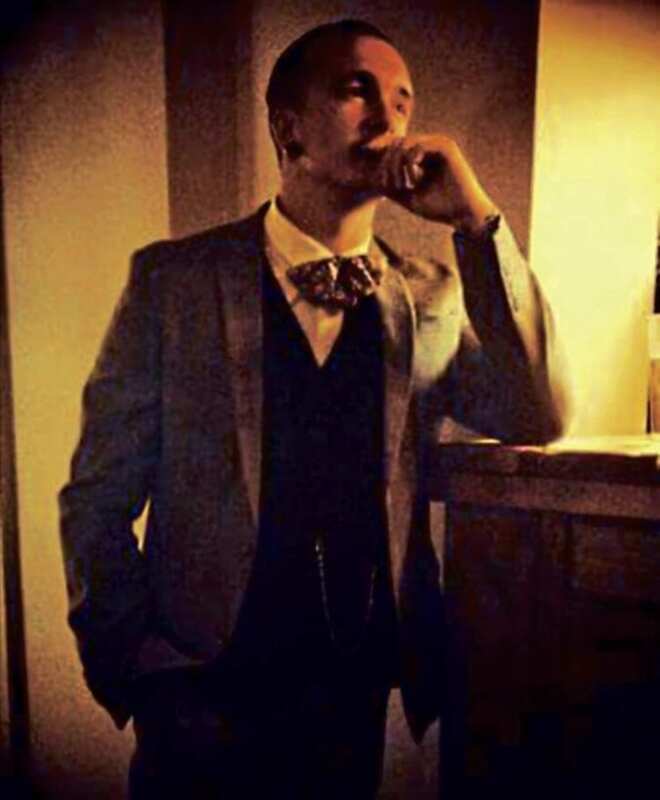 Inspiration for project: My son Shaun (Jnr) Williams. He’s only 25 but has always dressed and looked like a Peaky Blinder for years. Time to build & by who: Stripped and rebuilt it myself with the odd helping hand from a mate. In all, it took just over 14 months. I would also like to say a big thank you to Stuart Gentry at S G Engineering for doing the final part of the engine and getting it on the road. 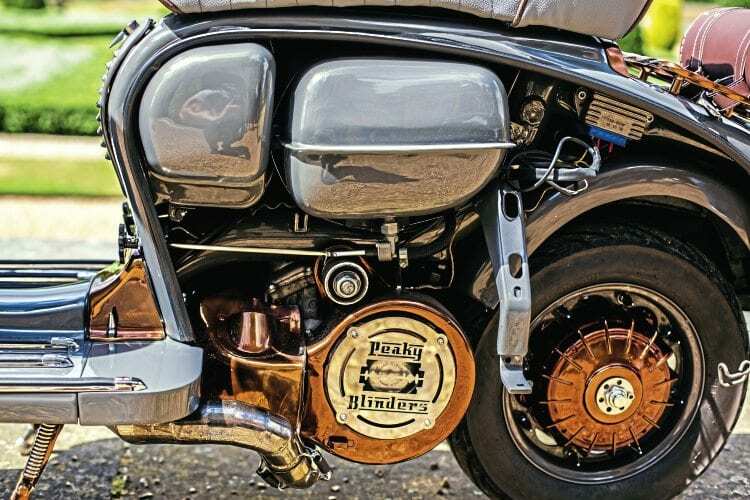 Any specialised parts: Laser cut Peaky Blinders razor blade splash plate, mud flap and legshield name plate and flywheel cover. All by Keith Newman at K2 Customs. Engine spec: RB22 with a Wiseco piston. Crank: Racing crank with 58 x 116 conrod. Carb: 30mm phbh Dellorto. 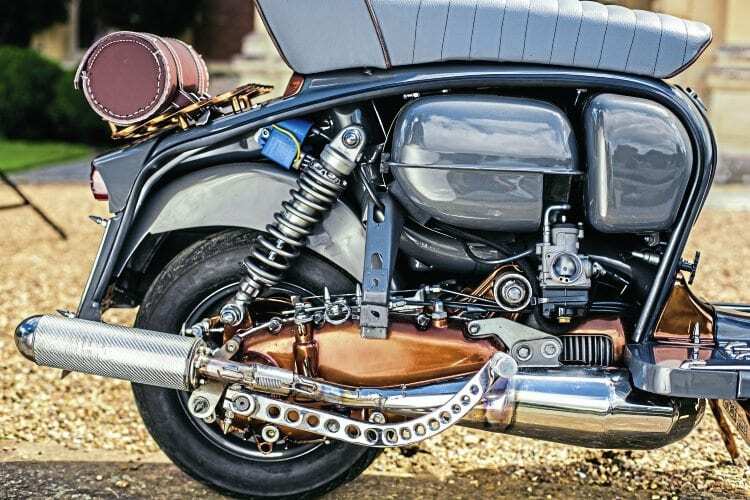 Exhaust: Franspeed tourer. Clutch: AF 6-plate. Gearbox: GP 200. Performance, power and handling: Starts first or second kick even after it’s been standing for a few weeks. Rides well and handles great. Other unique details: It was last road registered in 1984. 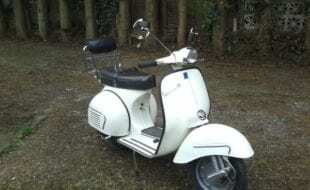 So it had no paperwork when I bought it, which was a bit of a problem, but with help from the LCGB and emailing DVLA I managed to get the original number plate for the scooter. Top & cruising speeds: I don’t know its top speed yet but it cruises comfortably at 50mph. Is the scooter reliable: Yes. Paintwork & murals done by: Ty at Pageant Paintwork, Snetterton, Norfolk. 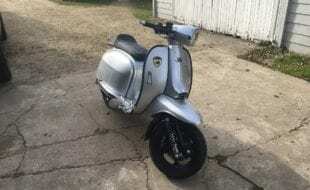 Overall cost: Buying the scooter, all the parts and paintwork £9000. The artwork cost the bulk of it but it was worth it. 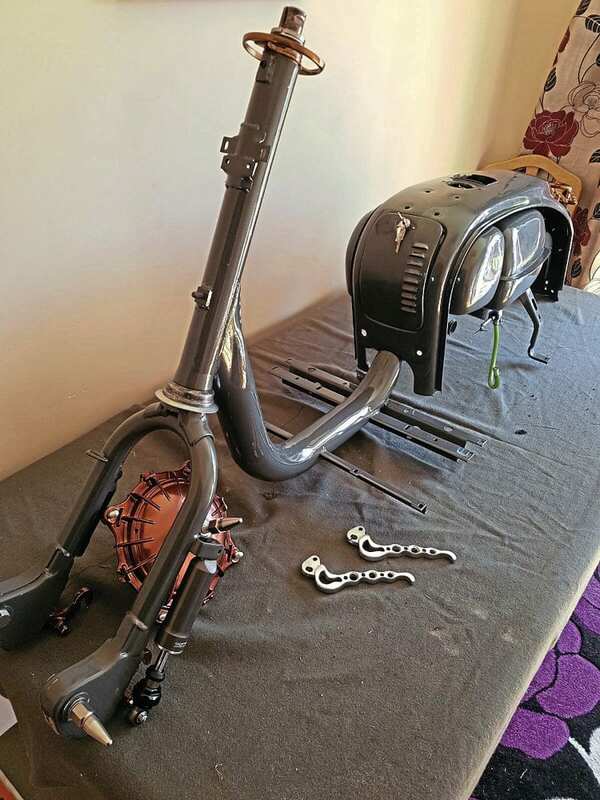 What was the hardest part of the project: Putting the fork internals back together while not scratching the paint, and finding the time between work and social life! Any advice or tips: Take your time, think about the end product. A dry build is a must. 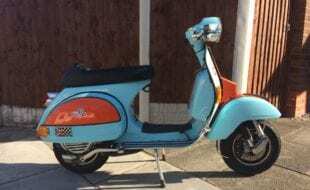 Is there anything still to add to the scooter: Maybe a better looking seat. I’m considering changing the exhaust end can to match the colour. 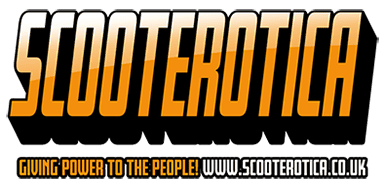 Has the scooter won any trophies: Best Paint – Bangers n’ Mash 2017, Best in Show – Leicester Phoenix Nights 2017, Best Custom Paint – Stagfest AFSC Thrash 2017, Best Paint – Suffolk Smugglers 2017. Thanks to: Ty at Pageant Paintwork, Stuart Gentry at S G Engineering, John Andrew Corcoran for making the covers to protect the paintwork, friends for advice and help and most of all my fiancée for putting up with me and letting me use the dining room as a workshop! The Royal Anglian Regiment is an infantry regiment. It is one of the most operationally experienced regiments in the Army and is one of the four regiments of the Queen’s Division. The regiment came into being following the amalgamation of various county regiments and thus can trace its lineage back to 1685. The cap badge, which is worn by all members of the regiment, consists of the silver star of the Garter (formerly used by the Royal Lincolnshire and Bedfordshire and Hertfordshire Regiments), with the Castle and Key of Gibraltar (of the The Suffolk, Essex and Northamptonshire Regiments).